Ashburton Grove - Arsenal news and Arsenal opinion: Vermaelen storm - Diaby crocked - Jens rejoins - Japan tour off? Vermaelen storm - Diaby crocked - Jens rejoins - Japan tour off? The manager held his pre-match press conference yesterday and it would be hard to think of another media briefing which has been so eventful. Obviously we've had a mid week off for the first time since before Christmas so there has been a void which the club have been quick to fill with news of a 41-year-old keeper's signing and the prognosis of how long arguably our best central defender this season would be out of action for. I doubt many of the journalists attending yesterday thought they would come away with their notebooks so full. The one piece of news stood out for me though. The manager's declaration that Thomas Vermaelen's season is over. "I never expected him to be fit before the end of the season." Not one of the journalists in their questioning of the manager asked the manager when he came to make this conclusion. But you would hope it was a recent thought rather than one made in January after the player had undergone surgery. If it was the later then it is possible that the manager has been negligent in his dealings in the January transfer window not to have bolstered the squad with another central defender - even if that meant signing someone on loan. However I think he's made this conclusion in the recent past because Vermaelen was meant to be back this season. The medical staff told the manager that it would be eight weeks maximum for a full recovery. But due to the set backs, that estimate has gone out of the window. I do agree with the views of The Beautiful Groan but I think the manager has also been over optimistic that everything would go as planned. When we were down to two fit central defenders in December/January with Squillaci out with a hamstring injury and Vermaelen had just undergone his procedure, the manager knew then we were down to the bare bones. Djourou hasn't got the a fitness record - this season is the most games he's played since he joined the club - and all things being equal would spend some time out. Whilst the French duo were in their first seasons playing football in a English league tougher than what they had previously experienced. The manager gambled on all three of them staying fit and Vermaelen's return. Unfortunately Arsene's bets never come in. I just hope at the end of the season we are not blaming our lack of cover in the centre of our defence for the reason we haven't picked up the league title. That would be an easy get out for the manager. But on the brighter side, Wenger did say that Djourou could play again this season. However the caveat here is that he'll be out for a minimum of six weeks. 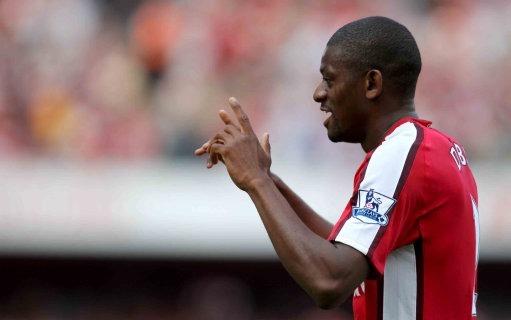 One thing which I didn't hear mentioned was a calf injury to Abou Diaby, which is mentioned in the bottom of this article on the official site. That will obviously create some selection headaches for the game on Saturday, with the boss also stating Cesc Fabregas, Theo Walcott and Alex Song won't be available because of injury. There will be an old face on the bench however with the news that Jens Lehmann has signed a monthly rolling contract until the end of the season. Anyone trying to convince us that the German and Manuel Almunia can't get along have obviously not seen them train together this week. UEFA announced that the boss and Samir Nasri will be banned from European competition for one match each and Wenger must pay a 10,000 euro fine after their bust up with Swiss referee Massimo Busacca. The manager has also called into question our pre-season tour of Japan - something that has yet to be officially announced by the club - because of the earthquake and tsunami. A transfer rumour from the Daily Mail suggests we're watching 19-year-old Charlton right back Carl Jenkinson. And congratulations to the five gunners who have been called up for France. Let's hope you return from the international break injury free.